Whether it’s in our cookies or served as a hot drink on a cold day, chocolate is everywhere. But where does it come from and how is it made? These are things most of us don’t think about when we unwrap a new chocolate bar. Today we answer these questions and explore cocoa production; the issues it faces and our role within the industry. 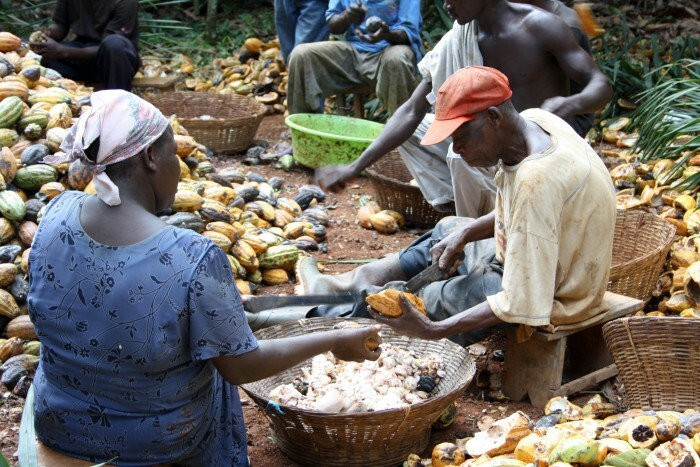 Cocoa is grown in remote, rural regions of the world by more than 4.5 million farmers. 70% of global production comes from West Africa and the largest producers are (in this order): Côte d’Ivoire, Ghana, Indonesia, Nigeria and Cameroon. The other 30% of cocoa is produced in a handful of countries around the world near the equator, as cocoa trees need hot and humid environments to thrive. Most cocoa farms are smallholder entities, with almost 90% of production coming from small farms under 5 hectares in size. There are also some large estates, mainly found in Ecuador and Brazil. While the average yield for a small farm is around 500 kg per hectare, for large estates this amount can swell to up to 3 tons of cocoa per hectare. Cocoa comes from the fruit, or pod, of the cocoa tree. Within these pods are seeds, which we call cocoa beans. To create the cocoa we have come to know and love, these seeds must be harvested and fermented. Cocoa is harvested over a period of several months once or twice a year as the cocoa pods on any given tree ripen at different times. 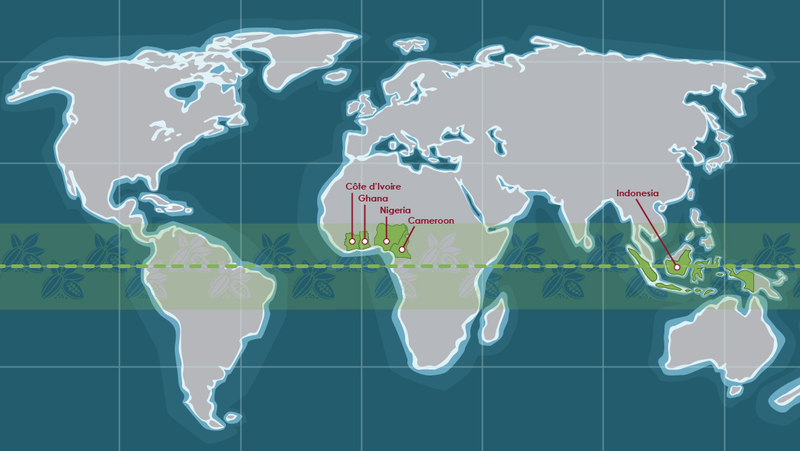 The timing of the cocoa harvest varies greatly from country to country, depending on the climate and variety of cocoa. 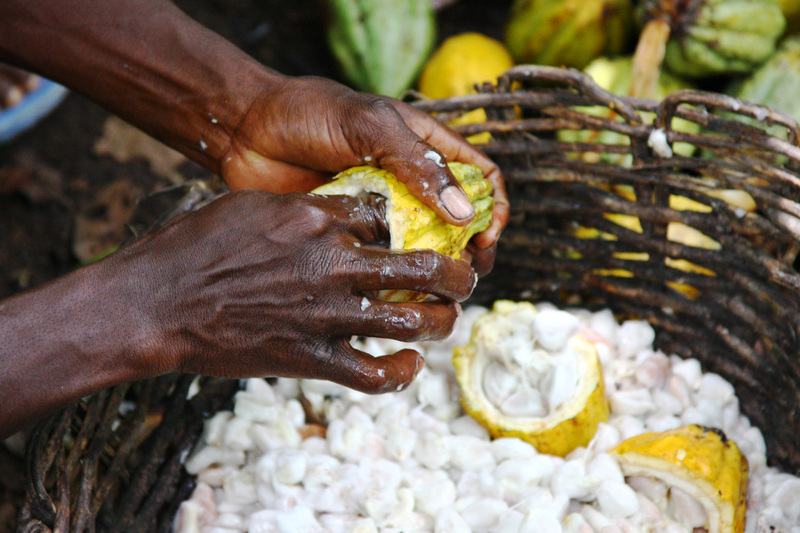 After being removed from the trees, cocoa pods are cut open by hand. The pulp and seeds are then piled together for about 5 to 7 days for fermentation to occur. The fermentation process gives the cocoa beans their brown color and helps develop their signature cocoa aromas. 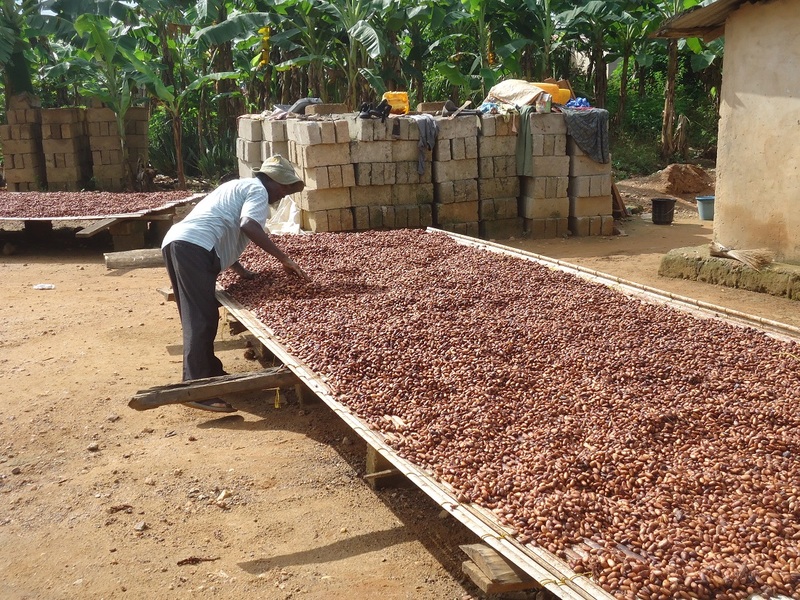 The beans are then dried by the sun or with artificial heat and are ready to be ground or exported. Before grinding, the cocoa beans are roasted and their shells are removed. Then the beans are processed into cocoa liquor which is further processed into cocoa butter and cocoa powder. Confectionary companies buy these products to produce the chocolate and cocoa containing products eventually sold worldwide. The average age of a cocoa farmer is between 45 and 50 years old, and farming is done by both men and women. With income from cocoa farming hovering around $0.50-0.84 a day in Côte d’Ivoire and Ghana, cocoa farmers are usually poor or very poor. Most young people are moving to the cities in search of better work. This makes cocoa farming a dying career path much in need of revival. The cocoa industry currently faces many social, economic and environmental issues. As mentioned above, cocoa farms are having trouble attracting young workers to the industry due to poor working conditions and low income for farmers. Meanwhile, cocoa productivity is low while demand for cocoa continues to rise. In several countries, this resulted in cocoa farming being linked to deforestation. Rather than investing in aging plantations with decreasing output, some farmers clear forest for new plantations. Due to a complex mix of reasons, many children work on cocoa farms as well, making child labor a rampant problem in several countries. Gender discrimination is also an issue on many farms with men generally in control of production and income. The number of women in leadership roles in local farming cooperatives is very low. All of these issues are only becoming more compounded as climate change makes weather patterns more unpredictable, greatly impacting yields and productivity on small farms. Even with all of these challenges, the cocoa industry is well-positioned for change. 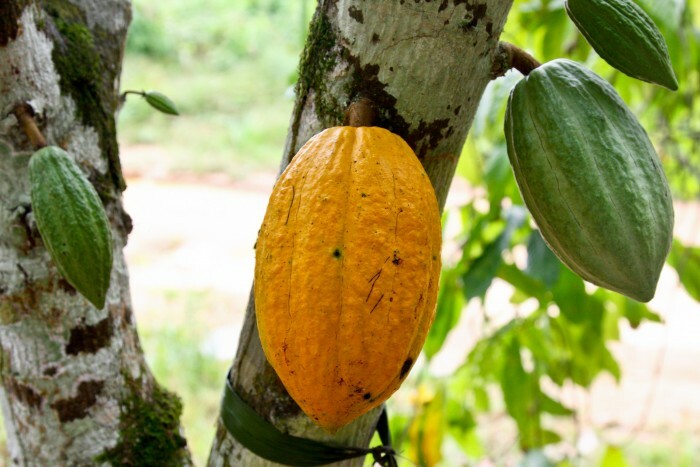 While the cocoa crop is currently eliminating much biodiversity through deforestation in some areas, if managed properly, the cocoa plant can provide many environmental benefits. For instance it can create habitat for primate species or help protect against erosion and land degradation. The cocoa industry itself is also highly concentrated with only about eight traders and grinders controlling approximately three quarters of the worldwide cocoa trade. This means that with industry-wide collaboration and cross-sector partnerships, change is possible on a large-scale relatively quickly. As the largest certification program in the world for sustainable cocoa, the UTZ programs works with more than 750,000 cocoa farmers in 21 producing countries (2017). We train trainers who train farmers on better farming practices and help drive investment in more sustainable cocoa production. We are also partnering with civil society, governments and large industry players through the Rainforest Alliance Sector Partnerships Program. By improving the lives of farmers, strengthening the lobby and advocacy capacities of NGOs and working with industry leaders, real change can start from the bottom up and top down. Through the UTZ program we take action to prevent child labor on UTZ certified farms, and with these initiatives we are working to make this practice more widespread throughout the industry. There is a long way to go before sustainability becomes the norm in the cocoa industry, but the sector is going in the right direction, and progress is being made. Do you believe that sustainable cocoa is the way forward for your company? Join the UTZ program today!